K Carberry: Do you refinish, restore or repurpose? Are they the same? Do you refinish, restore or repurpose? Are they the same? Ok, let me start by saying that I don't know much about antiques or vintage furniture. I'm learning, thanks to the internet and friends who just know these things. But, I don't always know the furniture style, type of leg, etc. Sometimes I can't even identify the wood type. I'm really clueless much of the time. BUT, I know when the wood is good (not rotted and not veneer), I know when I like the lines of the piece and I probably have an idea of exactly what I want it to look like when I'm done. Call me crazy, but I always keep something at least a week before I touch it with a brush because I want to really get a feel for the furniture...should it be sanded & stained or should I paint it? I hesitate to paint some things, especially if I feel like it is a valuable piece. I picked up a FABULOUS radio cabinet from the 30's at the Habitat ReStore for $10...and right away knew that it would be restored vs. refinish. Restoring something is actually a lot more work than painting, in most cases. Now, with all of that first paragraph said...I think it should be clear that I'm not an antiques purist. But, I don't like it when people say they reSTORED something when what they did was take a mahogany table or walnut chest and paint it bright red with black distressing. Hey, I'm all for freedom of expression and I like painted pieces. I've painted lots of furniture and will likely paint a lot more in the future. But...it's not really reSTORED. It's refinished. As for rePURPOSE...this is a totally different thing. Repurposing literally means to give a new purpose to an item. Say you take a chair seat and legs and turn it into the base for a shelf (I've seen it!) or a headboard and turn it into a towel rack. To me, that is what is defined as rePURPOSING. So, I don't know why I'm on this rant...but I can't be the only one who gets annoyed with these terms being used interchangeably, although they aren't. And funny as it is, one of my favorite shows, Cash & Cari is what started this whole blog. They use the term repurpose and restore WAY too loosely! I like the things they do in her shop...but it's NOT restoring! Ok, rant over for the day. Picked up a FABULOUS empire chest (see, told ya I'm learning) last weekend and am working on reFINISHING it. Someone put about 45 layers of stain and poly on it. And they didn't wait between coats so it's a bit sticky. There was also a veneer on top of a block of good wood, it's going away. Here's the before pic below. 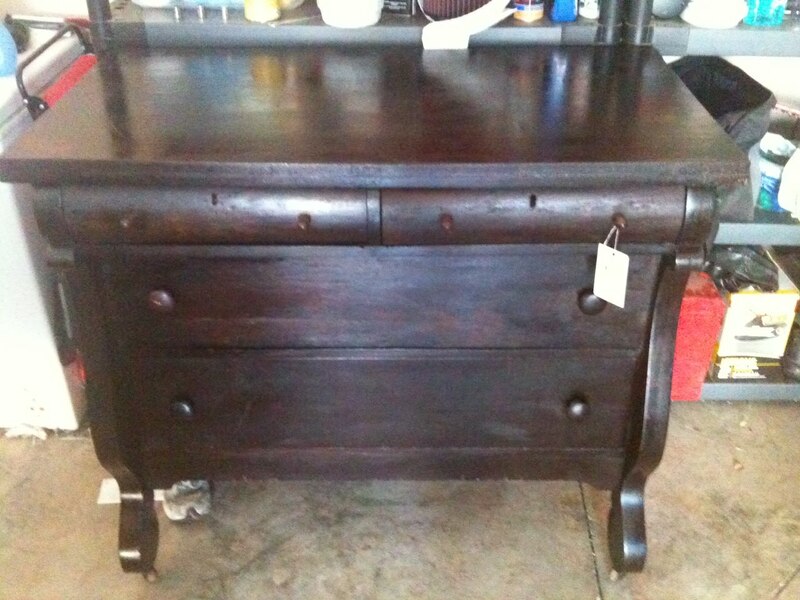 It's going to be black and will go in the nursery with the other fabulous Craigslist and thrift store finds. I have "lavish lavender" walls now and am moving right along. So excited! 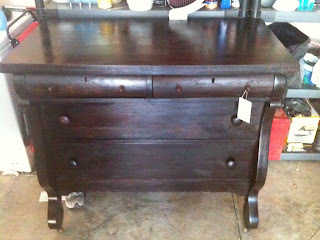 Great chest to refinish. I hope you will link it to my party when you finish it. I read your other post, congratulations! This is gorgeous! I'd love to have a piece like that! I can't wait to see it in the nursery! Thanks for your sweet comment on my "Pink Lady!"